I’ve had Friday, September 18 circled on my calendar for almost a year now, since I crossed the finish line at the Portland Marathon last October and qualified for the Boston Marathon after months and months of goal setting and training. Running Boston has been a dream of mine since I started running in 2007 and I fought hard to earn that BQ time, both at the Portland Marathon and then again at the California International Marathon last year. I couldn’t wait to cross that gold and blue finish line. You can imagine how difficult it was for me to go to the Boston Marathon website on September 18, click on “register,” stare for minutes at my computer screen, and then click on the X to close the page. 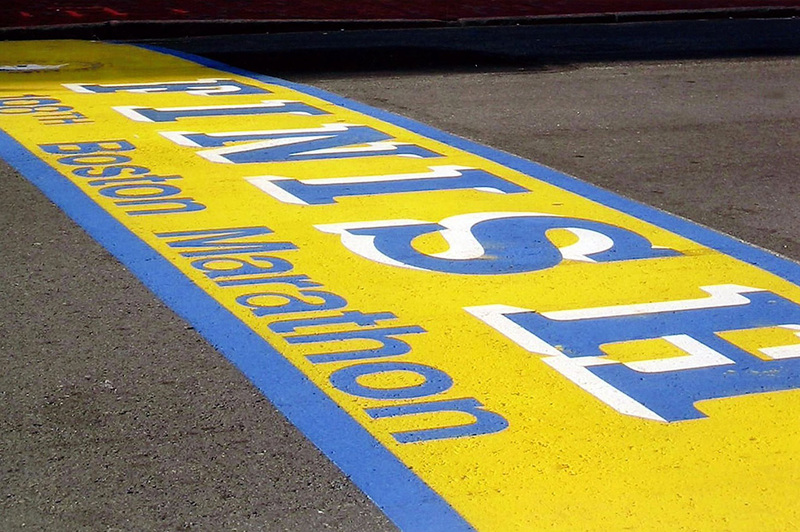 After giving it a lot of thought and careful contemplation, I decided that this would not be the year I would run the Boston Marathon. Why? Priorities change, dreams get put on hold, and not everything goes as planned. If there is anything I have learned this past year, it’s that you can’t always live exactly according to your plan. Sometimes you just have to be flexible and do what is best in the present. Besides, things always happen for a reason. When I had to withdraw from Ironman Canada after finding out I was pregnant, it crushed my dream of completing a full IM in 2015. But on race day, when the temps were in the low 50s and it was pouring down rain, guess who was glad they weren’t on the course? And just like that my initial disappointment had turned into an overwhelming sense of relief. Boston will still be there in the years to come. Right now I would prefer to stay a little closer to home and within driving distance to races during the first year of Axel’s life. My goals have also changed for the year and I really want to put my time and energy into training for a full Ironman. I am still contemplating whether this will be Canada in July, Coeur d’Alene in August, or Tahoe in September, but one of these will be on my schedule. I also plan on running a handful of half marathons and will likely throw in a couple 70.3 distance triathlons somewhere along the way as well. My schedule is tentative until I can sit down and discuss everything with my coach (and my husband), but I’m keeping an open mind as I learn to balance training, working full time, and being a stay at home mom. This leads me to another topic… where does the blog go from here? When I started Glitter and Dust it was a way for me to reflect on my journey as an athlete and share my experiences running and becoming a triathlete. Pregnancy has definitely steered the blog in a different direction for the past 9 months, as the baby growing inside me became the centerpiece of my world. It would have felt unnatural to talk about anything else. Now that Axel is here and I am on the path to recovery, I can’t help but get excited about sharing my training and race recaps as a new mom. There will definitely be a few Axel and “mommyhood” posts here and there, especially in these next few weeks while I still can’t do much activity-wise, but my hope is to really dial in on what training and racing is like during the first year postpartum and with an infant. I’m looking forward to getting back out there and re-learning about these sports I love. Have you ever set aside a big goal or dream due to timing? Moms out there – and advice for training with an infant? You know how those last weeks of pregnancy seemed to drag on and on and on…and on for me? Well, these first two weeks of Axel’s life have flown by in the blink of an eye. It’s not fair. My time spent pregnant couldn’t pass fast enough, and now my time spent with him can’t go slow enough. I just want to freeze time and hold his little body in my arms forever. I honestly had no idea how I would transition into the role as mom. I’ve never been around babies or newborns, and have never felt that “natural instinct” to become a mom, like many women do. My heart completely changed the moment Axel was placed on my chest in the hospital, and it was like a wave and rush of love instantly consumed me. Physically my recovery has gone better than I anticipated. The first few days were a bit rough, but that was mostly due to cramping, fatigue, and getting used to my new body. It really does feel quite weird to walk into the hospital with a huge belly and walk out two days later with just a pooch. Thankfully I never experienced any pain in the region of the actual birth, which was quite surprising! We’ve gone on a few small walks as a family. The first was just a short lap around the neighborhood to get some fresh air and expose him to the jogger a few days after he was born . It felt OK, but not great. The second was a mile walk through Shevlin Park one week post-partum. Part of me feels like I am starting from scratch, reintroducing my body to things that were once completely normal and natural. Hopefully it will all come back to me as time goes by. I have a feeling that neighborhood walks are going to become part of the routine. Axel loves the jogger already! Emotionally I have felt really good. During the first few days at home I was definitely riding a natural high and felt an overwhelming feeling of joy. Now that we are settled, family has gone home, and it’s just the three of us, my emotions are starting to feel more normal and stable. I’ve struggled a bit with how much Justin has had to work, as I was hoping he would have a week or two of paternity leave, but unfortunately there is no one else who can fill his responsibilities at work. I’ve missed some of that “family time” I was craving during the first couple weeks of Axel’s life, but am hoping he will be able to get a few days off in the near future. Breastfeeding is going better than I had anticipated. Axel instantly latched on and has been feeding like a champ. At his follow-up appointment with the lactation nurse he had already gained back all of his weight (8oz) in only five days! He earned the title of overachiever, making mama proud! The pediatrician said he checked out well and everything appeared to be normal and healthy. Our two week check-up is on Tuesday and I can’t wait to see how much weight he has gained, and ask the pediatrician a handful of questions about caring for him, traveling, and what to expect in the weeks to come. Night and day have become one and everything seems to blend these days. Just don’t ask me what day it is – I can’t be trusted. I guess this happens when you have some time away from work and all of your energy goes into taking care of a 7 ½ pound human. Sleep deprivation is real, but I am still sleeping better and more comfortably than I was near the end of my pregnancy. Surprisingly, the loss of sleep and waking up to feed and change him in the middle of the night does not bother me that much. Axel is typically awake by 5:30-6am, which I don’t mind at all. I am a morning person and love that quiet time when the sun in coming up. I’m sure it will catch up to me at some point, and there are moments when I notice the fatigue, but I have accepted the fact that this is “life” for a while. Day-to-day routine and priorities in general have already changed significantly. I spend most of my days in cozies (thank you fall-like weather) and care for Axel around the clock, feeding, playing, feeding, changing diapers, feeding, and staring obsessively at him while he sleeps. Justin and I have been out of the house with Axel a handful of times, visiting the pediatrician, taking a quick trip to Costco, and hitting up the grocery store a couple times. Going out and about with him is all about timing and I try to feed right before we leave the house. To be honest, I’m still a little nervous about venturing out into the world with a newborn by myself, but that will come with time (hopefully). Our cat Benny is handling the new addition to the family quite well. I was a bit worried about how he would adjust, as he is used to getting all of the attention in the house, but he seems to be okay with sharing the love. At first he kept his distance from Axel, but now he is starting to warm up to him and display a lot of curiosity. They both know how to nap like champs! Oh, and Benny is obsessed with sleeping on towels, hence the towel. Thank you all so much for the wonderful comments, emails, and messages I have received over the past two weeks! I can’t tell you how much I appreciate all of the love and support from readers.